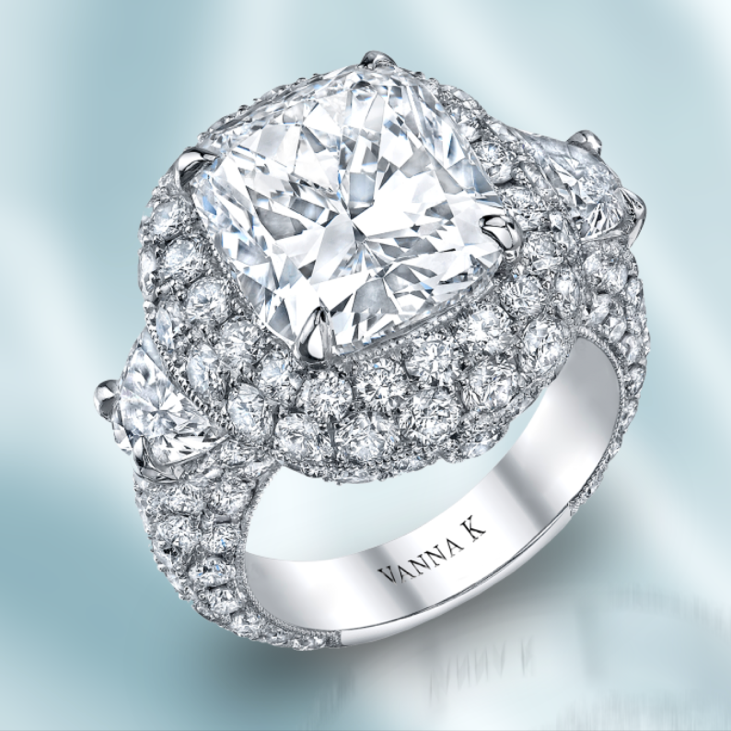 This exclusive 10 Carat diamond ring by Vanna K is truly worthy of a princess! Vanna K's attention to detail in design, combined with impeccable quality, is once again unmatched. Look at this new unique creation. It's a one-of-a-kind custom engagement ring from the Vanna K vault. They started with a sensational 6 carat cushion-cut center diamond (sometimes referred as "antique cut"), which is a pillow-like diamond you want to get wrapped up in. This brilliant stone is accompanied by a GIA grading report that confirms its excellent cut and excellent symmetry, which is rare for a diamond of this size and shape. The magnificent center stone is then surrounded by a crown of diamonds. What sets the design apart is how the unique cut of the center diamond offers a classically romantic look that distinguishes itself from the brilliant-cut diamonds used in the rest of the design. These different diamond cuts engage in a dance that makes this ring not only stunning, but so unique you can't take your eyes off of it. Most exquisite rings might stop with those gorgeous fundamentals, but not Vanna K. She tops off this ring with a touch of royalty by combining it with additional fancy shaped diamonds. The beautiful miligrain side profiles are highlighted by the half-moon diamonds accenting the edges. With over 10 carats in total weight, this ring is breathtaking from across the room, and across the miles! No matter where you are in the world, this beauty would be a truly unique find! Experience the Vanna K custom difference today. Find that one-of-kind unique engagement ring for your one-of-kind unique love today at Vanna K.